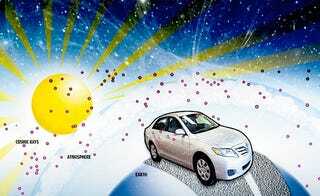 Federal regulators are studying whether recent Toyota sudden unintended acceleration problems are caused by cosmic rays. Seriously. Full NHTSA email below. The Detroit Free Press reports this AM that in an anonymous email last month to the National Highway Traffic Safety Administration, a tipster (who signs his email "a concerned scientist") said the specific design of Toyota's microprocessors, memory chips and software could make them more vulnerable than those of other automakers. He then went on to say that the phenomenon can trigger software crashes that come and go without a trace and "may be one reasonable explanation for incidents of sudden acceleration." Apparently the auto industry hasn't yet adapted the techniques used by aircraft firms and, you know, space ships, to prevent problems from solar radiation. So how will NHTSA test it? By putting Toyotas in front of a particle accelerator and showering them with radiation, of course! OK, seriously, I know this sounds ridiculous, and the part where NHTSA would put Toyotas in front of a particle accelerator gives off a vibe of complete tin-foil-hat ludicrousness, but there's some actual science behind cosmic ray electron interference. True, there's also a boatload of Fantastic Four-like science fiction behind it, so I'm just as skeptical as anyone else and I can't believe that this is seriously a problem. Mostly because I have no idea what makes Toyota systems so much more vulnerable than any other automaker. Any electrical engineers want to tell us in the comments?